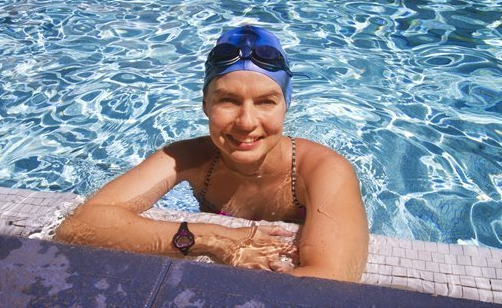 Every weekday morning, Joy Loudermelt finds her independence at the pool at YWCA Laniakea on Richards Street. For at least half an hour, and typically when the sun is near its lunch-hour zenith, she glides gracefully back and forth as light bathes the outdoor pool and surrounding palms and archways of the historic Julia Morgan-designed building. Loudermelt uses a combination of freestyle and breast stroke swimming techniques, reveling in every lap. Swimming is one of the few activities that Loudermelt, 32, can still command her body to perform. In any other medium but water, Loudermelt visibly suffers from multiple sclerosis, a disabling disease that has left her unable to walk. "I've always loved the water," she said. "Water is wonderful. I have so much freedom in the water, even if my legs don't do quite what I want them to do when I'm swimming. I can still move." Multiple sclerosis, or MS, is an unpredictable attack on the central nervous system. It disrupts the flow of information within the brain, and between the brain and the body, according to the National Multiple Sclerosis Society. The immune system attacks the myelin coating the nerves, and the brain can't tell muscles what to do. The cause of MS remains a mystery. While there is no known cure, some medications help manage its symptoms, which vary from person to person. The first symptom Loudermelt experienced about six years ago was her foot dragging and dropping after taking long walks, a condition exacerbated by heat. Water helps with that: Being in the water allows her to loosen the muscles in her legs. Other symptoms include fatigue and loss of balance. Because simple, everyday tasks can sometimes be tiring, Loudermelt rests a lot and takes plenty of naps. She gets to the swimming pool using an electric scooter from her condo in downtown Honolulu. "It's not easy," Loudermelt said. "The way I have a positive outlook is I don't think about what I can't do. I try not to dwell on that. I focus on, I can swim. I'm going to swim 30 laps today." For the past five years, Loudermelt has kept up with daily swimming at the YWCA because it's both physically and mentally therapeutic. Vangie White, manager of the YWCA's membership and health and wellness programs, said Loudermelt inspires her. "She has a positive attitude and always comes with a smile," said White, herself a swimmer. "I admire her for that." Swimming also allows Loudermelt to get her mind off problems. With MS, Loudermelt said, there's always the possibility of a flare-up, which can cause new or worsening disabilities. Exercise is a good way to relieve stress, which can sometimes trigger a flare. "When I get out there, I can focus on counting my laps," she said. "I breathe on every fourth stroke, so I can count one, two, three, four. . You focus on the counting, you focus on the breathing, and that just gets your mind off of something you don't need to be focusing on." Besides swimming, she might do some resistance exercises in the water from time to time. Upper-body strength is important for transferring herself from the scooter to a chair. While out and about in public, she sometimes encounters people who ask what's wrong with her and finds that many do not understand MS. She handles it as graciously as she can. "When you're passing someone on the street, they don't want the long explanation," she said. Loudermelt graduated with a biology degree from East Carolina University and moved to Honolulu five years ago when her husband, a military historian, got a job here at the Defense POW/MIA Accounting Agency. She loves being outdoors in the warmer weather. She grew up in the woods of North Carolina with an active lifestyle — she ran cross-country in high school and played rugby in college. Now she reads novels, knits with a group at the YWCA and cooks. Her cooking blog, "What's for Dinner" (joybeewhatsfordinner.blogspot.com), showcases recipe ideas for dinner and dessert. To cook, Loudermelt sits down to prep a meal and also sits at the stove. Though she has some limitations — she wishes, for instance, that she could get to the ocean more often — Loudermelt lives as fully as she can. "I like to focus on what I can do, not what's wrong with me," she said, seated at the edge of the YWCA pool. "I plan to be here swimming, every day, as long as I can do it."